Is Milan Skriniar Ready for One of Europe's Elite Clubs? Shrugging off more than a few seasons of mediocrity, there has been much to admire about Inter Milan so far in 2017/18. They have been top of the Serie A table, they boast the league's leading scorer in Mauro Icardi, and they have earned credible draws with title challengers Juventus and Napoli. The fact that the Argentina striker has been so prolific is no surprise, thriving on the creativity provided by Ivan Perisic and Antonio Candreva, while Borja Valero and Marcelo Brozovic deliver even more chances from their roles in midfield. Given that Luciano Spalletti is now in charge, the rising number of opportunities flowing towards Icardi is merely the universally admired coach continuing with the same swashbuckling approach he implemented with former clubs AS Roma and FC Zenit Saint Petersburg. But it is at the other end of the field where this version of the Nerazzurri has made an unexpected leap. 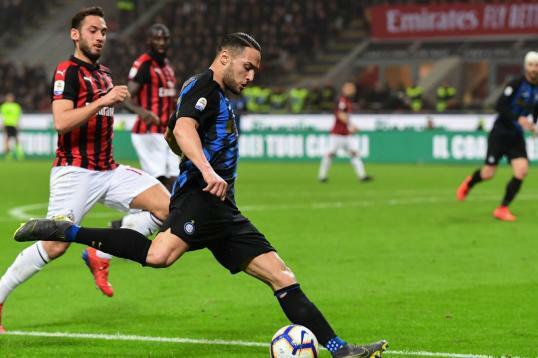 Inter have conceded just 13 goals in the first 17 games of the campaign, goalkeeper Samir Handanovic keeping no fewer than eight clean sheets over that period, including shutouts in those aforementioned meetings with Juve and Napoli. Yet what makes this shift even more remarkable is that Spalletti is working with almost the same squad that proved to be so leaky under Stefano Pioli, Frank de Boer and Roberto Mancini prior to his arrival. Handanovic might well be Europe's most under-appreciated goalkeeper, but the weaknesses of full-backs have been exposed repeatedly in previous campaigns. But while that duo—along with Joao Miranda—have looked much improved, it is unquestionably one summer signing that has finally made things click for this previously porous back line. Milan Skriniar arrived from Sampdoria back in July, the Nerazzurri hierarchy clearly impressed with his efforts during 2016/17. That was his only year with the Genoa-based club, and in his 34 appearances there, the Slovakia international showcased the perfect attitude and approach needed to succeed in Serie A. Many defenders have come to Italy with rigid ideas of how to play, their reluctance to move out of their comfort zone usually leading to rapid exits. Yet, from the outset, it was clear Skriniar possessed the intelligence, tactical flexibility and awareness needed to thrive on the peninsula. He instantly looked comfortable with the increased pressure that comes with playing for a high-profile club like Inter, too, turning in an outstanding performance in his competitive debut against Fiorentina. According to WhoScored.com, that 3-0 victory over La Viola saw Skriniar record one tackle, one interception and a game-high 10 clearances, leading a scrappy but resolute side to an important opening day win. As the campaign has progressed, so too has his play and that of the team around him. Arguably the most in-form central defender in a league loaded with high-quality players in that role, he has drawn praise from almost everyone who has watched his consistently excellent displays. "Skriniar is a great player; he's doing well," his new partner Miranda told Sky Italia (h/t Gianluca Di Marzio's website. "It was easy for me to get used to playing with him, and he can become amongst the five best defenders in the world." The duo have been almost impenetrable, with Skriniar showing his ability in almost every facet of the game. He is strong in the air, with figures taken from Squawka.com showing he has won 55 percent of the aerial duels he has contested, despite standing just 1.87m (6'2")—not overly tall for his role. Simultaneously, he has shown himself to be quick across the ground and diligent in his man-marking. According to WhoScored.com, Skriniar has recorded averages of 2.2 tackles, 1.2 interceptions and 4.8 clearances per game, yet committed just 15 fouls in more than 1,500 minutes of action. To time his challenges that well is hugely impressive and has seen him collect just one yellow card, a feat that looks even more incredible when noting he has already gone head-to-head with the likes of Gonzalo Higuain, Dries Mertens, Andrea Belotti and Edin Dzeko. Only the latter of that quartet managed to score against Inter, but while Skriniar is unquestionably an elite stopper, he has also shown excellent ability on the ball. As the tweet above indicates, his passing was excellent last term, and the 22-year-old has carried that over into the new campaign. He has connected with 91.4 percent of his 58.9 pass attempts per game, according to WhoScored, trailing only Valero and Matias Vecino among all Inter players, and that led to speculation last month that Skriniar could join one of Europe's elite sides. "I am not interested in Barcelona," he told Mediaset Premium (h/t FourFourTwo) when asked about the rumours linking him with a move to Camp Nou. "I play for Inter, and my objective is to play for Inter. I want to get them to win." Goals like the one shown below, scored in a recent 5-0 rout of Chievo, will help raise his profile, while Inter legend Beppe Bergomi—himself a superb defender during a stellar 20-year career with the club—recognised the immense potential of Skriniar almost instantly. "I knew from the moment he arrived that he could offer some interesting characteristics and qualities," the former Nerazzurri skipper told La Gazzetta dello Sport (h/t Football Italia). "Skriniar's playing style? He's a careful defender, he applies himself, he knows how to get the ball out of defence quickly and he also plays the ball forward." That is a fair assessment, and one that has led to Manchester City reportedly joining a rapidly expanding list of suitors. City manager Pep Guardiola is, per Jordan Russell at Calciomercato.com, believed to be ready to spend €50 million to bring him to the Etihad Stadium, and it is not difficult to imagine him thriving in England. Indeed, having watched Skriniar shine for Inter over the last few months, it is obvious that the Nerazzurri have signed an outstanding defender, one who would be worthy of a place in almost any team. He has brought a calming and resolute influence to a defence that sorely lacked both before his arrival, while displaying a superb sense of where and how to position himself in order to avert danger. Those are qualities every side needs and ones that Milan Skriniar has in abundance.